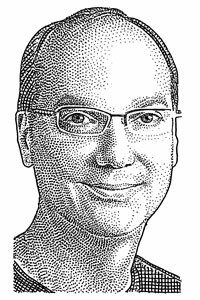 Although Andy Rubin’s keynote at D: Dive into Mobile is scheduled for just before dinner, expect to hear a lot of talk about dessert. On the menu are Froyo, Gingerbread and perhaps even a hint of Honeycomb. Google did release a couple of tasty treats already on Monday–announcing plans for the Samsung co-developed Nexus S as well as the release of Android 2.3 (Gingerbread). But I hear the cookie jar isn’t quite empty yet. 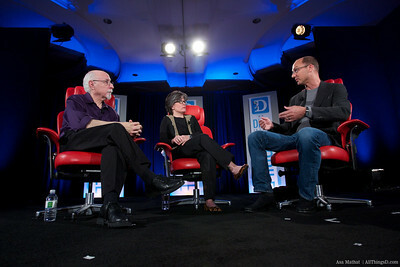 In between sugary snacks, Kara Swisher and Walt Mossberg will pepper Rubin on the many issues facing Android and the wireless industry. Mobilized will have live coverage of the session at this spot beginning around 6:45 pm PT. 6:37 pm: The crowd is still settling into their seats here at the Ritz-Carlton San Francisco, the swanky home to the inaugural D: Dive Into Mobile. 6:40 pm: Lights dim. 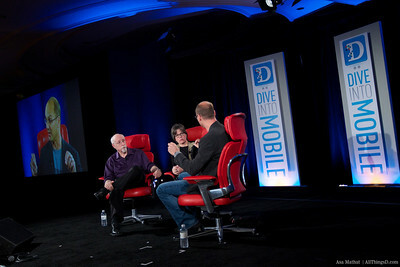 Kara Swisher and Walt Mossberg take the stage. “My husband, Walt Mossberg, and I would like to welcome you to this intimate dinner,” Swisher quips. 6:42 pm: Ironically, the crowd was asked to silence their mobile devices, but Kara says they should just feel free to leave them on. 6:44 pm: It’s Rubin time (and he has brought a satchel of goodies with him). 6:46 pm: Kara: So have you given up on that business model? Rubin: With Nexus S, which is the thing we announced today, we still have that notion of an unlocked phone. But we are not selling it ourselves, but through traditional channels, in this case Best Buy. 6:48 pm: Walt: How is Android doing? Rubin: Android started as an eight-person start-up. “During that time at Google we obviously staffed up.” Now there are 172 different phone models using Android after the OS was launched two years ago with one, the T-Mobile G1. Rubin credits the quality of the software and the open nature of it. Rubin: That’s the nature of open. That’s actually a feature of Android. He takes a swipe at Windows Mobile, saying that the alternative is a commoditized world where all the phones have to have a start menu in one place and all the icons have to be tiles. 6:54 pm: Kara: Do you consider yourself the Microsoft of phones in that regard? Rubin: No. We’re probably more like the Linux of phones, and that’s a true statement. Walt: You mean hard to get drivers for, only for geeks, no real consumer would buy it? Rubin: No, I think we’ve already proven that wrong. Bad analogy. 6:55 pm: Discussion about all the crapware that comes on many phones. Rubin: The consumers are voting and the consumers are voicing their opinions. 6:56 pm: Rubin has some relatively nice things to say about the iPhone. Rubin says that most developers actually are having a pretty easy time getting their apps approved by Apple. 6:57 pm: Kara: How do you consider Apple as a competitor? Certainly they make great products, Rubin says–robust, solid, good user experiences. A lot of consistency across applications. More recently I see them getting involved in the other end of the spectrum–services like a bookstore, the app store. 6:59 pm: Walt: What about Apple’s massive data center? That’s another area of competition for you guys. Rubin talks about the power of Google’s ad-based model, which allows the core advertising to fund all kinds of applications. Walt: Do you think Apple has the DNA to do this? 7:01 pm: Kara and Walt: Are you profitable? Is Android profitable? Does Android make any money? Rubin: We’re making money on the advertising that’s generated through Android. Walt: Are you profitable if it was broken out as a separate business? There’s no way I would have ever been profitable as a start-up. I probably wouldn’t have made it as a separate company. 7:06 pm: Walt: How do you see the rest of the competition beyond Apple? Rubin: I don’t think it’s ever going to be just two [Apple and Android]. There’s a lot of innovation and a lot of ideas out there. 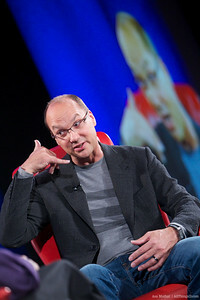 Rubin says there is a fundamental advantage to Android and iPhone since they are new and designed from the ground up. He notes even Windows Phone 7 has legacy code from the original Windows Mobile from way back when. 7:08 pm: Walt: Is there anything you do like about Windows Phone 7? Rubin: It was a big bet. They struck upon that notion of the centerpiece of the main tiles. It’s a good 1.0 product. It does look different and it does look unique. It’s solid. I’m not the predictor of being successful. He says if he were to give advice to Microsoft, he would suggest that it give more freedom to carriers and phone makers so the devices don’t look the same. Kara: Have you gone to Finland to woo Nokia? Rubin: I haven’t been to Finland. Walt: Forget Finland, have you tried to convince Nokia? 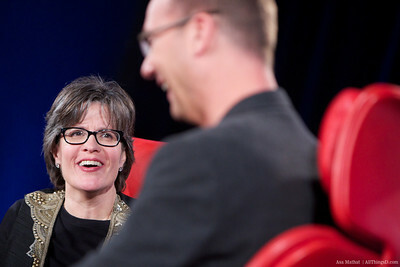 7:12 pm: Kara: The discussions with Nokia–talk about them in detail. Rubin: The company has new leadership [referring to CEO Stephen Elop]. They are evaluating lots of alternatives. I’m open-minded and a big proponent of Android. Rubin again declines to talk about any meetings he may have had. 7:14 pm: What about the challenge of iconic products like RIM? Rubin: Talks about the challenge of legacy and points out Motorola had that problem when it became overly dependent on the Razr. Then, “they bet the company on Android,” he points out. Rubin said RIM is doing the right things–acquiring assets like QNX and DataViz to build a more modern operating system. 7:16 pm: Walt points out that RIM will be here Tuesday–PlayBook tablet in hand. 7:16 pm: Back to the discussion about persuading companies to use Android. Rubin: If it’s good–and we all believe that it’s good–everybody can use it. 7:17 pm: Walt asks about tablets. Are they exciting to you? Are they important to you? Can they replace laptops for some people? Rubin: I think what is going on in tablets is interesting. It’s fundamentally changing the model of computing interaction. It is much more physical. You touch it. You feel it. 7:19 pm: What changes in the paradigm? It’s not a laptop. It’s not a phone. Rubin points out that we used to have PDAs, but the cellphone eventually replaced it. The tablet is a sort of in-between device so the use case is less clear. You might definitely have it on the couch, but maybe not on the subway. 7:21 pm: Walt: What makes it more interesting and more immersive? There is something different there? Rubin: If you do a good job, what you’ve done is make it a reflex. Like a car. You learn how to drive and you can drive almost any car. You don’t get distracted by things. That’s the result of many, many years of evolution. That’s true of any consumer product. They become almost like second nature for you. 7:24 pm: Kara and Walt ask about privacy. Rubin: There is nothing in open source Android OS that sends keystrokes or what applications you use to Google. He encourages people to look at the source code. Walt: There are Google services that do collect certain things? 7:27 pm: How do you overcome the perception that Google wants to collect more information than the others? I think you just have to be transparent. You have open source–be inspectable. Any other interpretation is either FUD or just people who don’t understand. 7:28 pm: On to the goodie bag. Rubin pulls out a Nexus S. Says it is his personal device. Kara: Oh good. She grabs it and pulls it close to her. Now Rubin is showing the features, screen, etc. He’s talking about the Near Field Communications technology that is actually printed inside the back of the case. NFC allows a phone to scan specially printed tags. Walt: Is that what sends all the information back to Google? Rubin: Laughs. Goes back to demoing NFC and showing the Nexus S scanning a tag, which sends a URL for a video of the Nexus S to the phone, which then starts playing. 7:31 pm: Rubin talks about the applications: Buying coffee, getting coupons. What we are hoping is third-party developers create a lot of cool apps. Devices can also use NFC to exchange contact info between two devices as well, kind of like beaming in the old Palm days. 7:32 pm: Rubin is talking abut the Nexus strategy. To give a “Pure Google” phone. Google works with the hardware maker to take maximum advantage of Android’s features. 7:35 pm: What’s new with Gingerbread? We added a garbage collector. Added broader voice over Internet Protocol support. Can cut, copy and paste without a trackball. 7:36 pm: Walt: What about video calling? I know there are third-party apps that do that. It seems like a natural thing that it belongs in the phone function. 7:38 pm: Rubin reaches into his bag of tricks again. Pulls out a prototype Motorola tablet to show a forthcoming version of Google’s mobile map application. 7:38 pm: Shows the improved 3-D abilities and new panning and zooming options. What we are showing off here is some pretty cool performance. “It will be available for cellphones in a matter of days,” Rubin says. What allows the new presentation is that maps are no longer a series of tiles, but rather vector graphics. 7:40 pm: Vector data is smaller and more efficient, so users can load data in case they go offline. “You could load a whole state,” Rubin says. This app runs on Android only for now, though it will work on tablets and phones. Rubin: That would be a natural extension. 7:41 pm: What version of Android is running on that tablet? Rubin: Honeycomb [the next version of Android, due out some time next year]. There are no buttons on the Motorola tablet. He’s showing his personal email again. 7:43 pm: More on Honeycomb: We added new APIs to Honeycomb that allow an application to split its views to multiple views. On a a tablet they can be side by side, while on a phone they might be one after the other. 7:46 pm: On to Q&A. 7:46 pm: What about the Chrome OS team? What’s the delineation between the two? There’s no need to argue. We’re doing both, Rubin says. 7:50 pm: What are the plans for the Android team to focus on the enterprise? We did a little bit, Rubin says, but he likens it to baby steps. Support for VPN and some secure browsing. Gingerbread has some added features like remote wipe. Each release you will see more and more. 7:51 pm: App discovery. What are your plans? Rubin: This is all evolving. The Android market is evolving as well. Gingerbread allows “related applications.” We are always adding features. As a search company, if we can’t help you discover apps, I think we have a problem. We should be very easily able to organize a few hundred-thousand apps. 7:53 pm: Question about mobile payments; What is Andy Rubin’s vision? Groupon? Rubin: I think there is a lot of opportunity. It is not an opportunity that is going to be seized by one company. Today Android does carrier billing integration, so you can put apps on your carrier bill. Creates an efficient micropayment option. With Nexus S having added gyroscope capability, can see things from even within a store. Should help make, for example, better coupon apps. 7:57 pm: Android on TVs? Rubin: That’s exactly what Google TV is. It is Android running on a set-top box. The first versions of that are running an Intel processor. Have demonstrated the same app can run on both a three-inch screen or a flat-panel TV. 7:58 pm: Question about carrier data plans and pricing. Rubin: Average usage on an Android phone is 440MB a month. Rubin points out we are at a bandwidth crunch, but that it tends to be a cycle. New networks tend not to be overwhelmed by demand at first, but then the demands grow. Then new networks come along. How should OEMs try to differentiate? Rubin: I think HTC has done a really good job with Sense. Motorola has Blur. People are really differentiated. Rubin says he often hears complaints about fragmentation. “Fragmentation” is the wrong word. Different phones do things differently, but that’s differentiation. Basically the apps are still compatible, Rubin says. 8:04 pm: Is Android too clunky? Will we see a sea change where Android really gets more user friendly? Rubin: I would probably characterize Android today as an enthusiast product for early adopters–or wives of tech enthusiasts. 8:05 pm: Rubin says the company made some concessions that led to “geeking it out.” But then there are apps that offer easier customization and personalization. 8:07 pm: Walt points out places where it requires an extra step to do things like compose an email, while the iPhone does it in a single step. 8:08 pm: Applause and they exit stage. ‘Night.